The Republican National Committee (RNC) has begun to support Roy Moore again, according to media reports. The RNC has reportedly offered the controversial Alabama senate candidate support after Donald Trump backed him for the office. The US President endorsed him in an official capacity on his Twitter page, where he said his vote on a variety of issues would be needed. 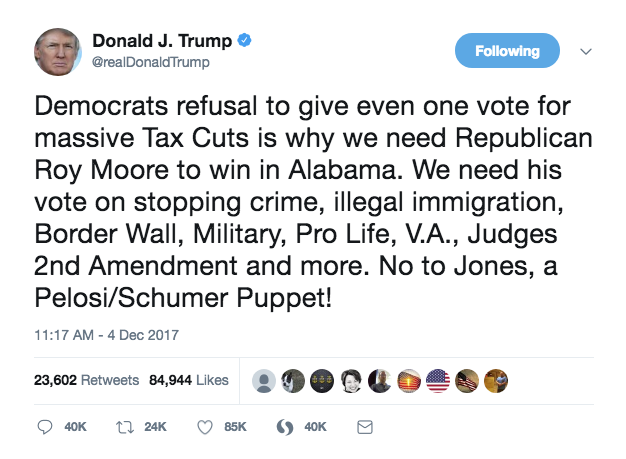 Trump implored the voters to say no to Doug Jones, who he called a "Pelosi puppet" - a reference to Nancy Pelosi, minority leader of the US House of Representatives. Sources close to the RNC then told media website The Hill the organisation had followed suit with their support. The RNC withdrew its backing for Moore in October after several women accused him of sexual misconduct and said - along with the National Republican Senatorial Committee (NRSC) - it would not offer it to him again. At this point, it is not known what prompted the change of heart. Roy Moore has constantly denied the allegations against him, saying they were politically motivated.